So how bloody cute is this little watermelon wedge! It’s for holding your nail art tools and it certainly stops them from rolling right off the table. (Anyone else have ‘alive’ dotting tools that like to spontaneously roll away?) Also if you’re painting both your hands, the stand gives the tools enough height off the table to ensure that you don’t smudge your wet nails on the table when trying to pick them up. 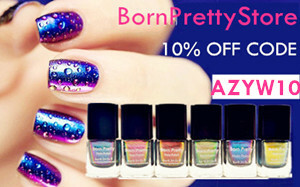 So handy, but also just a cute thing to have on your mani table! As it’s ceramic, it would also function quite nicely as a chopstick holder. The stands are inexpensive and come in a variety of shapes (how cute is the deer? And the owl. And the whale actually) so would certainly make a lovely gift too. I decided to do some quick nail art, which unfortunately turned out horrendous. (Why that yellow base?!) But rather hilariously it looks like some sort of evil, smirking face. Anyone else see it? So these were meant to get published yesterday, on my regular posting day, but I managed to mess up the scheduling blergh. 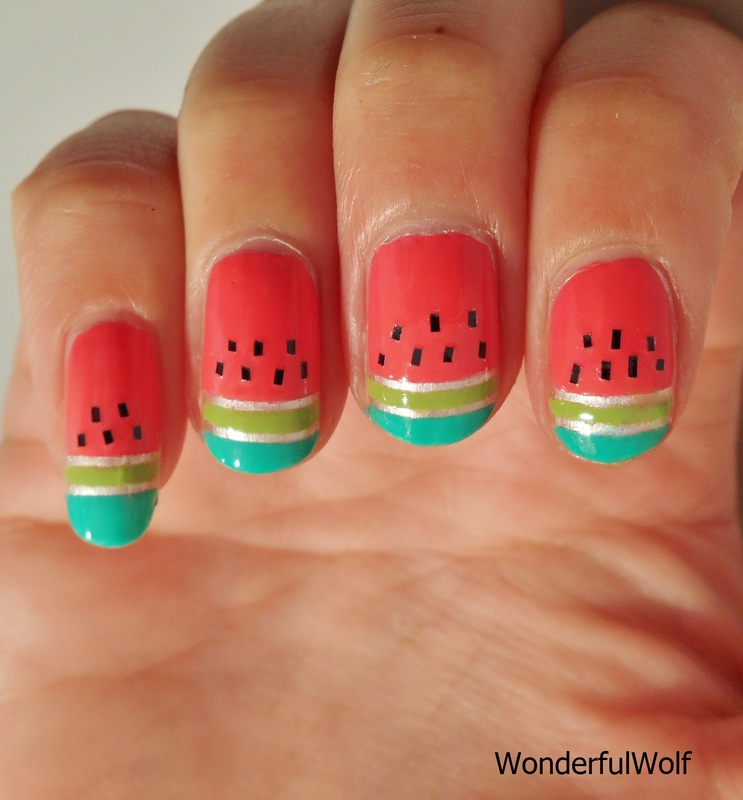 It’s getting closer to summer, and that means watermelons! I love watermelon, but it’s always so expensive and sometimes doesn’t taste nice. 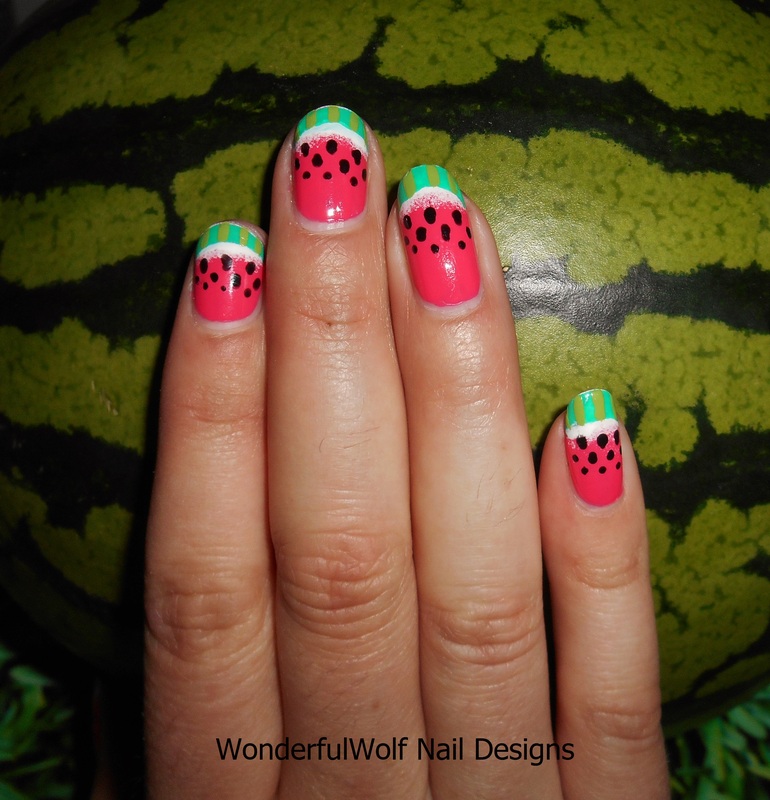 Watermelon nail art also doesn’t taste nice, but it is super cute! Unfortunately the colours didn’t show up too well on my camera but if you follow me on Instagram- @wonderfulwolf – you’ll get a better idea of how they really look. So I actually recently painted a watermelon design, therefore I wanted to do something different from the ‘norm’. I went for a more contemporary (yeah?) style using nail tape for the lines and seeds. So that kind of sounds like one of those ridiculous algebra questions you got in High School where you’d have to solve for ‘Kiwi’ or something. But in reality it’s actually how nail polish mathematics works. My mum bought me two new polishes Barry M’s ‘Kiwi’ and ‘Grapefruit’ and I thought they made the perfect combo to create a watermelon. I freaking love watermelon, but unfortunately they’re always so expensive, tasteless, and tiny – totally unlike the ones you buy on holiday that drip with juice and could probably feed you for about two weeks! After taking part in #prettypediprojectuk, I couldn’t help but paint my toenails again as I enjoyed looking down and seeing some cheerful nails.